Just when I thought I was getting over the whole crackle thing, these come along and renew my interest. 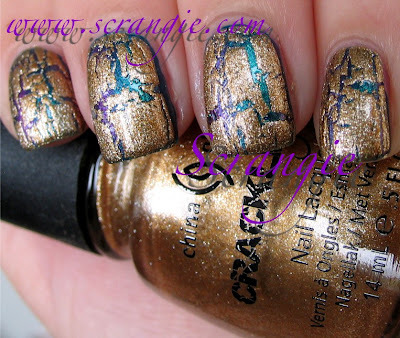 Previously, the only options for crackle topcoat were cremes, but recently there have been a few shimmer and foil crackle topcoats cropping up. These China Glaze Crackle Metal crackle glazes are some of the prettiest crackle topcoats I've seen; they're crackle FOILS. Crazy, sparkly, ethereal, shimmering metallic foils. Take a look! China Glaze Cracked Medallion (over Essie Super Bossa Nova). This is a light brassy-bronze foil crackle topcoat. Extremely sparkly (as are all of these shades) yet light and airy looking as well. Not too dense, it doesn't drown out your base color. China Glaze Haute Metal (over Wet n Wild Black). This shade is a light, rosy pink metallic foil crackle topcoat. Silver based. China Glaze Latticed Lilac (over Ozotic 505, which itself is over Finger Paints Art of Theft). This one is a silver base pale purple/lilac foil crackle topcoat. This reminds me of an old China Glaze color. Trying to remember the name. Was it Barefoot In The Park? I know it was from that collection. The ones that came with little nail decals on the neck of the bottle. Anyway, I'm digging the way this looks with the teal side of Ozotic 505! China Glaze Oxidized Aqua (over Essie Brazilliant). 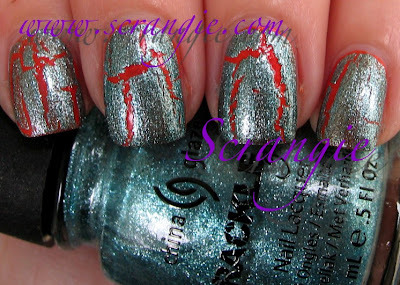 Oxidized Aqua is a silver based light aqua blue crackle topcoat. Foily finish. Light and pretty and oceany. China Glaze Platinum Pieces (over Pure Ice All Night Long). This is a straight up silver foil crackle topcoat. No blue tones. It's more of a white-silver, or a light shade of silver. Compared to the other silver crackle topcoat I have, OPI Silver Shatter, this is lighter in color and less dense/more sheer and lets the base color peek through. 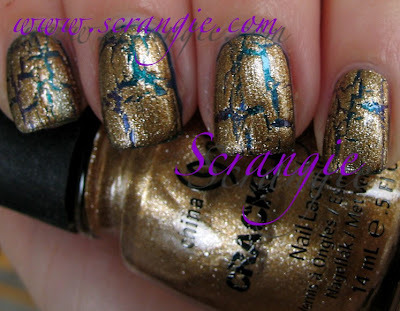 China Glaze Tarnished Gold (over Ozotic 505 which is over Finger Paints Art Of Theft). Saved the best for last. This is a less brassy shade than Cracked Medallion. It's a neutral and almost taupe-toned gold foil crackle topcoat. I think this looks amazing over the duochrome goodness of Ozotic 505. I didn't plan this combination! It happened by chance! I just put some of the new crackles over my existing mani to test them. As luck would have it, it turned out awesome so I took a picture of it. Seriously, try this over a duochrome if you have one handy. The formula of these is good. It's much thinner than any other crackle topcoat I've used. These shades are a little watery and therefore rather sheer, but it all works out in the end. Once they crackle, they shrink up/bunch together a little which makes them more opaque. They dry very quickly, but if you try to apply topcoat too soon after applying, it can smudge the crackle so be careful of that. I've also noticed that these don't seem to dry in the neck of the bottle as quickly as other crackles. Just for fun, I did a few more of the shades over black. The black base really shows how sparkly and jewel-encrusted they look and it gives great contrast. So pretty over black. Left to right (pinkie to index) is Cracked Medallion, Latticed Lilac, Tarnished Gold and Oxidized Aqua. Two thumbs up from me. These are gorgeous. They apply easily and don't seem to dry out as fast. They add sparkle unlike any other crackle topcoats. I heartily approve. Thanks for the great swatches! I'm so glad you're back to posting I've been so lost w/o your wonderful work lol! I really like the blue crackle! Great pictures! Hopefully I can get a hold of some of these nail polishes this time around last time there were none in stores! Your color combos will keep me up tonight with scheming to get my grubby hands on these crackles. All of them are GREAT!!! I love some of the color combinations you did here :) Great swatches as always, thanks for showing us these ones! Not a fan. They look too thick to me - again like rubber on top of a nice mani. I really thought maybe this metallic collection would be a renewal of some minor interest in crackle/shatters for me - but nope! Leaving them without one even tempting me. If anyone can make these look good then you can. I quite like them over black but that's as far as it goes. I wouldn't actually buy them. These are amazing. I love any kind of glitter though! I need to have these! Pretty swatches! There are all so gorgeous! Your review of the formula has me sold on them too - I love OPI's silver shatter, but I get frustrated with the dryout in the bottle neck. 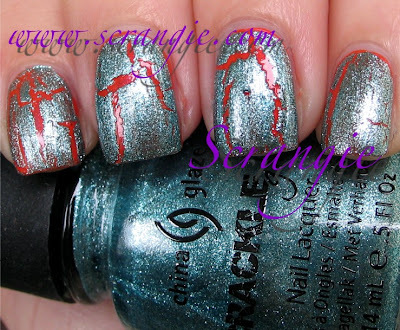 I'm really not a fan of crackle polish... but I really like that pinkish silver one and the turquoise one. Might have to pick those ones up! Same - I thought I was all crackled out, but then these came along. It's weird, but I feel like I need to own every colour that every colour that each company puts out to complete my collection. It's so addictive! 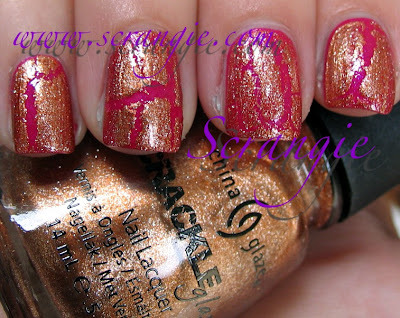 I hate crackle/shatter! I think it looks vile. Can't imagine wearing it without wanting to scratch it off. I just wish it'll be passe already. I havent had a chance to try these! They look great, I like the different combinations! Interesting! I am not too sure if I want them though because I particularly like the way OPI Shatter cracks more than China Glaze Crackles.. I really like Haute Metal though! I am SOOOO jealous! I want them all! Hi! This is old, but it was concerning this China Glaze metallic polish, so I thought I'd post it here. Have you had trouble with the silver and gold ones changing color overnight to a lighter shade of whatever was underneath it? That's happened to me twice now, even when I put clear polish in between the layers. I tried for a festive x-mas green and silver and I got a sort of queasy green and chartreuse. When I tried purple and gold, it changed to dark purple with what looked like a sort of lilac lace over the top. In both instances my nails got complements, but neither had the effect I was looking for. Is there another way to prevent this, maybe another brand of clear or something? (I used a Sally Hansen clear). My e-mail is zenspinner@yahoo.com if you can't reply to comments here. Thank you for any advice! I also have a question about the crackle! Sorry, I know this thread is old but I consider you the expert on all things polish, and I stalk your blog all the time. Anyway, my question is related to the crackling of the China Glaze Platinum Pieces. For some reason it's not crackling and I don't know why. I don't think I'm doing anything wrong. I use OPI Shatter (the black one) and that's the only one that works. I love this look once in awhile but the results aren't consistent. Oh, btw I got this China Glaze at Sally's. Do you have any idea why this would be happening? China Glaze Platinum Pieces won't crackle for me. I don't know why. The only other crackle type polishes I've used are OPI the black one (works great) and OPI the white one (terrible, chucked it in the trash). I'm beginning to think only the black works! For me, anyway! Am I just having a run of bad luck with defective batches? Heard of this happening to others at all? I let my polish dry all the way before applying crackle. So frustrated, as I love this look once in awhile! Hmm... Have you tried shaking it? And I mean shaking it pretty hard for at least a minute. I've had some crackles stop working like that and they were fixed by making sure they got mixed really well. You could also try putting it over polish that's not dry yet. I think I've mentioned that crackles need to be used on dry polish, but after experimenting a lot with them, I've found that's not always the case. If the polish is too wet, the crackle will pull it apart and you'll get bald spots, but if it's slightly wet (but already set), it should help. Thanks for your reply! I tried again with the Platinum Pieces (both of your suggestions) and still strange results. I find I get somewhat better results if I "hop" the polish and deliberately leave spaces on the nail, creating sort of my own crackle effect? From looking at your swatches of this polish, I really think something's up with mine. Yours looks thicker, where mine is really watery. I'm keeping it, though: I discovered it looks great over pastels! The minimal shatter isn't so obvious then, and the subtle shimmer is pretty. Oh, Crackle, you are a lovely thorn in my side! Thanks so much again for the suggestions!